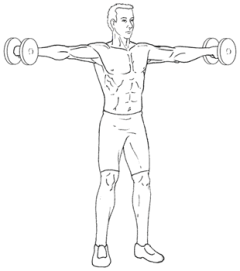 Standing, holding dumbbells with in both hands, elbows slightly bent, raise both arms to the side simultaneously until parallel with floor and then lower to starting position again. Keep elbows at a height equal to wrists as you raise the weights. Keep palms facing towards each other at the bottom of the exercise and downwards as you raise to keep the emphasis on the side delts. Failing to do the above two things can result in unnecessary shoulder strain – if you find yourself gravitating towards making the mistake of raising the weights with your hands above the elbows, you are likely using too much weight. The side delts are a small muscle group and you won’t be able to handle a great deal of weight and maintain form – form is the key, don’t let your ego sabotage the effectiveness of the lift. Do not lock your arms on this exercise. You want a slight bend at the elbow, just barely to keep it from locking out. The more you bend the elbow, the easier the exercise becomes due to leverage. Elbows bent at 90 degrees is a beginner variation – but lessening the load with slightly bent elbows will accomplish the same thing. Do not raise the arms above the shoulders. Doing so takes the tension off the delts (putting it on the traps) and can cause shoulder problems. Legs are shoulder width apart and knees are slightly bent. You can bend at the waist slightly to where you can bring the dumbbells together at the bottom of the exercise. Bending down further will shift the target muscle from the side deltoids to the rear deltoids (Bent-Over Lateral Raise). Lateral Raises can also be done seated with the same form but are most commonly done standing. One-Arm Lateral Raises – Your off arm holds on to a support (like a pole) allowing you to concentrate on one arm at a time. Lying Lateral Raises – Lying on your side with your off hand supporting your head and your legs sprawled for balance, you perform the lift in the same basic way. Machine-Based Lateral Raises – Cable machines give you an option to perform the exercise as well as the occasional lever machine you might find. Upright Rows do a good job of targeting the side delts as well as Armpit Rows (start with dumbbells at sides and then pull them up as though you are trying to place them in your armpits). The Arnold Press can also hit the side delts a little bit. Find out what nutrition you need at the most critical feeding times – before and after your workout. and doing your very best.